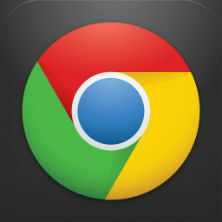 Launched in 2010, Google’s Chrome Store is the go-to place for people looking to pimp their Chrome browser. Often referred to as apps and extensions, the programs offered by the platform run in Chrome and can perform a dazzling array of functions, from improving security and privacy, to streaming video or adding magnet links to torrent sites. Also available on the Chrome Store are themes, which can be installed locally to change the appearance of the Chrome browser. While there are certainly plenty to choose from, some additions to the store over the past couple of months are not what most people have come to expect from the add-on platform. Free movies on Chrome’s Web Store? 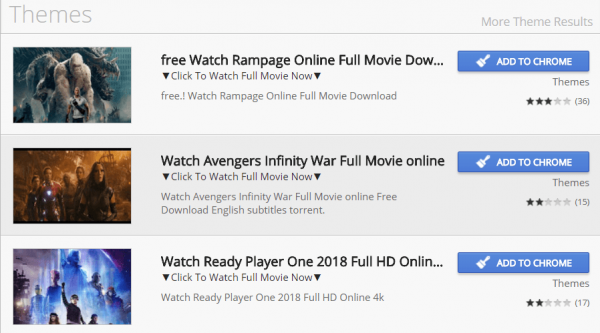 As the image above suggests, unknown third parties appear to be exploiting the Chrome Store’s ‘theme’ section to offer visitors access to a wide range of pirate movies including Black Panther, Avengers: Infinity War and Rampage. Of course, the whole scheme is a dubious scam which eventually leads users to Vioos.co, a platform that tries very hard to give the impression of being a pirate streaming portal but actually provides nothing of use. “With over 20 million titles, Zumastar is your number one entertainment resource. Join hundreds of thousands of satisfied members and enjoy the hottest movies,” the site promises. With this kind of marketing, perhaps we should think about this offer for a second. Done. No thanks. In extended testing, some visits to Vioos.co resulted in a redirection to EtnaMedia.net, a domain that was immediately blocked by MalwareBytes due to suspected fraud. However, after allowing the browser to make the connection, TF was presented with another apparent subscription site. We didn’t follow through with a sign-up but further searches revealed upset former customers complaining of money being taken from their credit cards when they didn’t expect that to happen. Quite how many people have signed up to Zumastar or EtnaMedia via this convoluted route from Google’s Chrome Store isn’t clear but a worrying number appear to have installed the ‘themes’ (if that’s what they are) offered on each ‘pirate movie’ page. At the time of writing the ‘free Watch Rampage Online Full Movie’ ‘theme’ has 2,196 users, the “Watch Avengers Infinity War Full Movie” variant has 974, the ‘Watch Ready Player One 2018 Full HD’ page has 1,031, and the ‘Watch Black Panther Online Free 123putlocker’ ‘theme’ has more than 1,800. Clearly, a worrying number of people will click and install just about anything. We haven’t tested the supposed themes to see what they do but it’s a cast-iron guarantee that they don’t offer the movies displayed and there’s always a chance they’ll do something awful. As a rule of thumb, it’s nearly always wise to steer clear of anything with “full movie” in the title, they can rarely be trusted. Finally, those hoping to get some guidance on quality from the reviews on the Chrome Store will be bitterly disappointed.